Outside, it was warm and humid – unusual for an early autumn afternoon in Chicago. As I arrived at the Drake Hotel and proceeded into the hotel lobby, I couldn’t help but relax after sensing the palpable calm inside. Leaving the noise of the city behind, the interior of the Drake was a welcome oasis. As I walked up a short flight of stairs, I could already hear faint harp music drifting through the air. “Afternoon Tea, Sir?” “Yes,” I said, “Thank you.” I was shown to my table and immediately began to unwind. The Drake Hotel is located on Chicago’s Magnificent Mile overlooking Lake Michigan and was built in 1920, designed in the Italian Renaissance style. Visitors to Chicago are often advised to take Afternoon Tea at the Drake as one of the not-to-be-missed things to do in the city. Past visitors to the hotel include Winston Churchill, Prince Charles and Princess Diana, Elizabeth Taylor, Judy Garland, and Frank Sinatra. 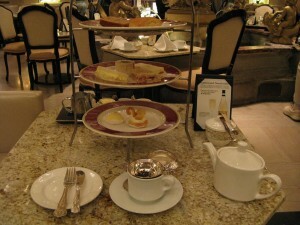 Afternoon Tea at the Drake is served in a club-like secluded room off the main lobby called the Palm Court. The room is dominated by a beautiful limestone fountain with a 275 year old French-bronze urn at its center. When I was there, the urn was filled with spectacular white flowers. The service was perfect, attentive yet not overly so. It seemed as if each time I poured myself another cup of tea, someone would appear to refill the teapot. I felt welcome, unhurried and relaxed. Soon a three-tier tray appeared with four finger sandwiches prepared on freshly baked bread – Roast Beef, Cucumber and Tomato, Egg Salad and Asparagus & Ham. On a second tier was a freshly baked raisin scone along with a thin slice of banana bread. Finally, the sweets included a vanilla dome and a swan shaped creme puff. The accompaniments were lemon curd, strawberry preserves, and English Double Devon Creme. The china service was Rene Ozorio – Aura. To my left a group of women were thoroughly enjoying themselves, conversing and seeming genuinely happy to be in each other’s company. To my right and behind was a mystery couple, tucked away into a dark corner presumably to avoid prying eyes. Having enjoyed the soft harp music and sampled the Palm Court’s delicious custom tea blend along with several of its sweets and savories, it was – unhappily – time to close the chapter on this visit to the Drake Hotel and its wonderful Afternoon Tea service. 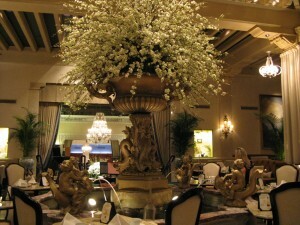 This entry was posted in North American Teas and tagged afternoon tea, chicago, drake hotel, high tea. Bookmark the permalink. I’ve been there twice but the Chicago Peninsula high tea is much better. ambiance and food. We live in Chicago and have pretty much done tea at every available hotel. In the Loop area, but not in a hotel, the Russian Tea Time is the best value with a bit of European tea room atmosphere quite different from the luxurious surroundings in the big hotels. My niece, great-niece and I had a ‘ladies’ day out’, and took afternoon tea at The Palm Court. It was delightful! Like you, I enjoyed the Palm Court Blend; my niece chose Bombay Chai; her daughter selected Pear Caramel for her tea blend. The food choices were the same, save there was no Asparagus and Ham; instead there was Smoked Salmon with Cream Cheese on Pumpernickel, which was excellent. Everything was excellent: tea, food, ambience, service. It’s perfect for a special occasion. Does anyone know if there are gluten free items offered at the high teas; if so where.